It's once again time to look at a reader-submitted website and learn about how to build better, more effective sites based on real examples. In this edition of the Friday Website Review, we're exploring an e-commerce store and taking a closer ​look at the effects of visual communication on your site's conversion rates. The site we're looking at today is Protect Your Pumps. The theme used on the site is the Minus theme which you can find here. Share this post, to spread the word about Friday Website Reviews. I hope you enjoyed this video! If you have any questions or feedback, please leave a comment below. Shane Melaugh is a co-founder and the CEO of Thrive Themes. When he isn't plotting new ways to create awesome WordPress themes & plugins, he likes to geek out about camera equipment and medieval swords. He also writes about startups and marketing here. Great review Shane… I definitely appreciate the time you spent putting these together. Glad you got some good value out of this, Paul! Lots of great points noted in this website review! As you mention, the correct theme selection can take care of some layout elements, but there is more to good website design. Your comments in this website review about the choices for specific individual elements provides some excellent insights and is a great way for us to leverage your experience! Thank you for your comment, Stephen! Glad to know you like the reviews. Thank you Shane for this review and so good advices. I learnt about it and will try to implement in my next e-commerce site. I will share your review on Social network. By the way you never replied to my demand for month related to be Thrive member with special conditions because I am non profit developper (working for supporting ALS medical research e.g. Ice Bucket Challenge). Thank you for your comment! We currently don’t have anything separate set up for charities. I’m not opposed to it, but it’s something we have not gotten around to doing. Thanks Shane. Enjoy your reviews. Keep them coming. Very useful as always. The challenge for many sites is to find suitable images that convey the message but aren’t boring. In Protect Your Pumps I can totally understand why images of high value shoes is used as the product itself hardly lends itself to high quality imagery. I guess it’s important to try and be creative without losing sight of the product itself. Sometimes subliminal “selling” works well – say scuffed up soles on a show worn by a model with normal legs contrasted with shoes with Protect Your Pumps worn by a model with very shapely calves. Scattered around the later 3-5 examples of the product. Just a thought. I like this suggestion, Mark! Sneaky, but it could be really effective. These reviews are useful, Shane. Even if you bring up similar critiques on different websites, the fact that they are implemented different allows you to see variations of the same problem. The repetition — us adult learners need the repetition! — is a good thing for those of us that watch all of these reviews. Thanks for taking the time to do these. I think all learning requires some level of repetition and seeing the same principles applied to different situations is what makes them become really clear. At least, that’s something I hope these reviews help with. Thank you for your comment, Mary! I just looked at the site and thought how gorgeous it looked. Then I listened to your comments which made great sense. Thanks Shane for keeping it simple. Thank you for your comment, Joan! Thrive University is an online learning platform that gives you access to all of our guides, courses & webinars. 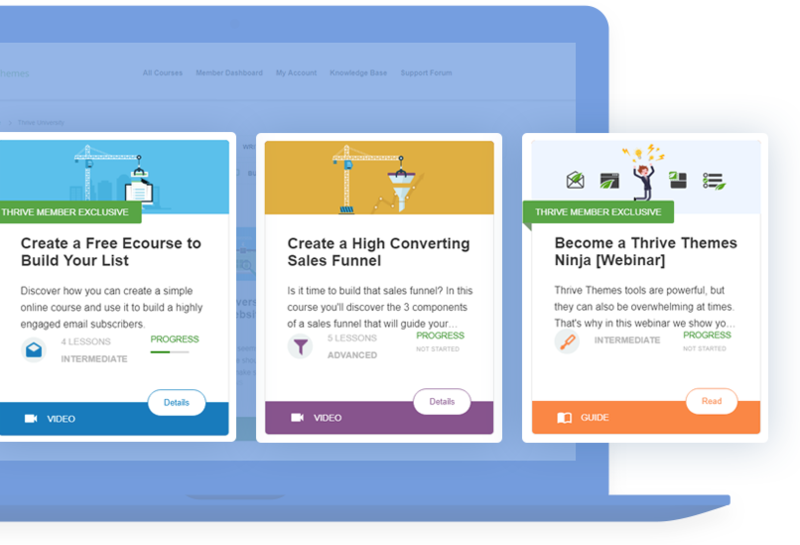 Learn how to ​create websites, landing pages and opt-in forms that are built for maximum conversions, from the ground up and get an inside view of our favorite tactics and tools for growing any online business! Sign up to our newsletter and get instant access to Thrive University: a growing library of online courses to grow your online business.